"It was staggering to watch Angela. Her ability to enthuse and inspire broke barriers and transcended boundaries." Angela’s colour exercises have proved to be a highly effective method of working with individuals or groups of people of all artistic abilities. 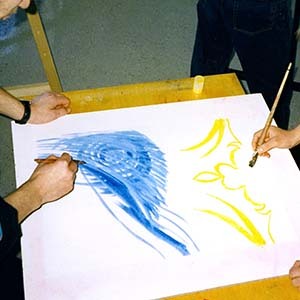 Based on Goethe’s Theory of Colours but developed specifically for working with offenders, the exercises draw participants’ awareness to their own behaviour and tendencies as an individual or within a group. For many prisoners, an art project serves as a stepping stone to further education or employment. 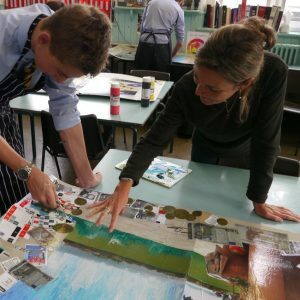 Art helps raise self-esteem, the single biggest barrier to learning. It also inspires people to become interested in their own abilities, teaches them many soft skills such as deferred gratification, working in a team, problem solving as well as offering a mirror to their thoughts an emotions. 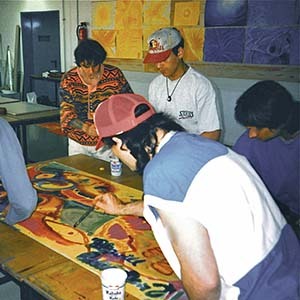 The principles of Angela’s work can be transferred across mediums to add a therapeutic and rehabilitative element to any existing art class, workshop or training day.